I'm having some fun today with Party Girl Florence from High Hopes. This gal just cracks me up and reminds me that life is supposed to be fun. This card is going to be perfect for a friend of mine who is one of those quite ones...but secretly a party girl at heart. Thanks so much for stopping by wishing you a Happy Friday, hugs! I'm finally back to back to blogging after more than a 6 month break. We have had so much going on things just kept getting in the way. BUT I'm back, can't say that I will be posting everyday or anything like that but I will try to pop into share at least once a week. I don't know about you but coloring is my go to stress relief. So let's get this show on the road already! This adorable cutie is called Sick Ollie. 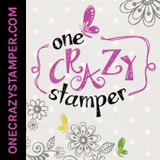 Ollie is one of the new releases from my company High Hopes Rubber Stamps. This release is called "Get Well Soon". Coloring one of these images means you have a loved one or a friend who is under the weather, that's sad. But just think of the smile you will bring to their face when they get an adorable card from you. They will know for sure that you were thinking about them. I went for a real CAS card here, not a lot of bling. Don't you just love those papers...I sure do! They are from Digi Doodles Designs. Now I have a stack of patterned paper...so high you can hardly imagine. However, I LOVE Dina's Digi Doodle papers. What I like about digital paper is I can print just the one I want when I need it. I printed two pieces of paper on my Epson Workforce printer in a snap. Both sheets were 8 1/2 x 11 but the actual patterned paper sizes were just 6 x 6 & 8 x 8. So I had no waste because I used the left over pieces inside my card. The left over white pieces of cardstock I have saved to stamp images on...so no waste there either. You can pop over to Dina's site HERE and see here other papers. There is even scrapbooking collections for those interested in that. I used the Clouds from the Bundle of Joy & the Easter Yellow Gingham from the Easter Paper 2 Collections. I do hope you will come back to join me again....thanks SO MUCH for visiting today!! I know it's Summer now BUT hockey season is just around the corner. This card is for all the hockey fans out there. I have used Sam's Big Play from High Hopes Rubber Stamps. I kept it clean and simple. The sun is shining and it's a beautiful day here in Southern Ontario, all little hot but still beautiful. Today I'm sharing Gigi from High Hopes Rubber Stamps.